If your cells are healthy, then you're going to be healthy. If your cells become damaged, then your health suffers. So it makes sense to keep your cells as healthy as possible. For years, medical science believed that DNA in your cells held the secret to everything. But there's a part of the cell that's just as important to look at for good health. And by looking at this part of the cell, researchers are making some amazing advancements. So what is this part of the cell that's vital for your good health? It's the cell membrane. The cell membrane is the "skin" around your cells. If the skin around your cells gets hard, cracked or damaged, then bad things start to happen to your cells, your organs and your whole body. Even more importantly, the skin around your cells has to be permeable. That means it has to let good things like nutrients and oxygen in, while keeping bad things like toxins out. Your cell membranes are the first line of defense against cellular injury and likely where the aging process really begins. The trouble is, we face a lifetime of assault on our cell membranes ... from heated rancid oils to heavy metals to free radical damage. Over time, this assault simply overwhelms your cell membrane's ability to function, repair itself and survive. But what if there was a way to strengthen your cell membranes, and improve the health of every single organ in your body? Well, there's growing scientific evidence that it's possible. In fact one simple nutrient can have this stunning effect on your body. So what is this powerful nutrient? It's called phosphatidylcholine ("Foss-Fah-Tidal-KO-Leen"). Phosphatidylcholine is a complex form of fat. This complex fat is critical for cell membrane function. It makes all your cell membranes more fluid and flexible. But as you age, your cell membranes lose this life-giving molecule. By the time you are in your 70s, your cell membranes may only have about 10% phosphatidylcholine left. Which means your cell membranes just aren't working as well as they used to. If your cell membranes aren't healthy, then you aren't going to be healthy. That's why poor cell membrane health has been linked to many health problems. Like heart and cardiovascular problems, memory loss, liver failure, even fatigue and insomnia. You could try to block cholesterol from entering your body by eating high-fiber foods. Or by taking supplements such as turmeric or beta glucan. Or, you could try to reduce the amount of cholesterol produced by your liver using natural remedies, such as red yeast rice or policosanol. But what if you could get cholesterol to change directions from deep inside your tissues and bloodstream and go back to your liver ... where it could be eliminated from your body? Well, believe it or not, phosphatidylcholine does exactly that. It mobilizes the cholesterol already present in your tissues to do an "about face" and march right back to your liver. It does this by triggering an enzyme called LCAT. This enzyme converts free cholesterol into a form that can be flushed from your artery walls and tissues. Then, the cholesterol is transported back to your liver where it is excreted as bile. This reverse cholesterol transport is unique. All other remedies either reduce the absorption of cholesterol in your body or slow down the creation of cholesterol in your liver. They do nothing to get rid of cholesterol that's already buried deep inside your tissues or stuck to the walls of your arteries. A certain type of phosphatidylcholine works so well that I now give it to many of my patients with vascular problems. I'll tell you more about that in a minute. But first, let me tell you what else phosphatidylcholine can do for your memory, circulation, immune system and literally every cell in your body. Ever meet someone you recognize but draw a blank on their name? Or find yourself searching for something you had in your hands just a minute ago? We've all had "senior moments" like these. And they seem to get worse as we get older. You see, phosphatidylcholine triggers the release of "messenger chemicals" in your brain. These chemicals are part of just about every single message sent by every nerve in your body. They help keep electrical messages zipping across the gaps between your nerve cells. Can PhosChol Add Healthy Years to Your Life? Scientists ran an experiment with two groups of 30-month-old (middle-aged) lab rats. They gave one group of rats an injection of phosphatidyl-choline, followed by a second injection one week later. And then maintenance injections every two months. The control group of rats didn't get any injections. The untreated rats lived for an average of 34 months, which is a normal lifespan for rats. But the rats getting phosphatidylcholine lived for another 8 to 14 months on average. That's a whopping 36% increase in lifespan! And keep in mind the scientists started this experiment when the rats were already middle-aged. By the way, each month of a lab rat's life translates into 2 years of a human's life. So that 36% increase would translate into about 25 extra years for a human. Are you starting to see why taking PhosChol can have such a profound effect on your health? Ask for your risk-free trial supply today! 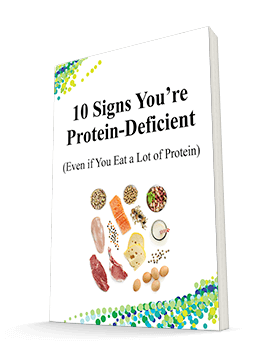 Having enough phosphatidylcholine is especially important as you get older. Because you absorb less choline into your brain as you age. 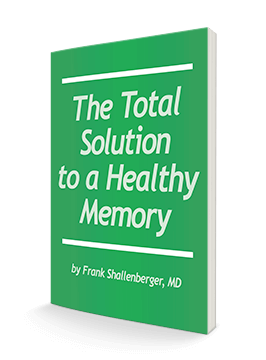 And now scientists have discovered that by adding purified phosphatidylcholine to your diet, you can slow down and even reverse the mild memory loss that comes with age. In one study, scientists gave phosphatidylcholine to a group of middle-aged mice. The control group got a regular diet. What the scientists discovered amazed them. Normally, dendrites get smaller as we age. But the mice getting phosphatidylcholine had up to a 166% increase in dendrites compared to the control. In fact, the elderly mice had more dendrites than younger mice. In other words, they grew a younger brain! That makes sense, doesn't it? Your brain is mostly cell membrane. So giving your brain the raw material it needs to grow healthier cell membranes is bound to help your brain work better. Taking phosphatidylcholine may be the single best way to get back the mental sharpness you enjoyed years ago. So you can easily remember names, numbers, learn new things faster, and keep up with younger folks. If you ask people what their most important organ is, many would say it's their heart or brain. But if you ask me, I'd say it's the liver. Your liver is your body's vital protective organ. Without your liver, you can't digest food properly, absorb nutrients or get rid of toxins. PhosChol is the first and only 100% pure source of phosphatidylcholine available in North America without a prescription. PhosChol delivers 10 to 30 times more active phosphatidylcholine than standard lecithin or other phosphatidylcholine products. Your liver needs healthy, flexible cell membranes to do all these jobs. In fact, your liver has more than 300,000 square feet of cell membrane. That's more than 4 football fields in area! But a lifetime of exposure to fatty foods, chemicals, medications, alcohol and other toxins can gradually poison your liver. All these toxins can trigger inflammation as your liver struggles to get rid of pollutants. This inflammation can lead to fibrous growths in the liver. As more of these fibrous growths appear, liver cells begin to die. Scar tissue forms. Once the damage reaches a certain point, it can kill the liver. So you have to stop this inflammation before it damages your liver. One way to stop it is to eliminate poisons like alcohol or toxins. Another way is to take phosphatidylcholine. Phosphatidylcholine can reduce liver damage caused by alcohol, viruses and toxins.1 It helps rejuvenate your liver — since liver repair involves the creation of massive amounts of cell membranes. In one study, scientists gave alcohol to animals as part of their diet. Half the group also got phosphatidylcholine, the other half didn't. Result: 83% of the control group developed liver damage. Meanwhile, the animals getting phosphatidylcholine had livers that were perfectly normal! When we're born, our cell membranes are about 90% phosphatidycholine (just think how soft and supple a baby's skin is). But our production of phosphatidyc-holine declines with age.3 So by the time you are in your 60s, your cell membranes might only contain 10% phosphatidylcholine. As the amount of phosphatidyl-choline declines, the amount of cholesterol in your cells increases. This can interfere with your cells ability to function properly. Add to that the constant bombardment of toxins and chemicals and your cell membranes are really under attack. But phosphatidylcholine helps your cell membranes rejuvenate themselves. So they can keep out these nasty toxins yet still absorb the nutrients your cells need. Given how important phosphatidylcholine is for your brain, arteries, liver, stomach and more, you need to get more of it into your system — fast! And the best way to do that is with the highly purified form of phosphatidylcholine found in PhosChol. Click here now to get your risk-free trial. Scientists also conducted studies on humans with advanced deterioration of the liver. They found that phosphatidylcholine was able to speed up recovery times and shorten the amount of time patients spent in the hospital. Phosphatidylcholine also helps restore healthy lipid (fat) levels. This enables the liver to regenerate damaged liver cells. So the hardest-working organ can finally get the respect it deserves — and the support it needs — to clear out toxins from your body. Now here's some exciting news that I've only recently uncovered. Phosphatidylcholine helps you produce more of your body's most important antioxidant — glutathione. Glutathione is your body's premier protector from toxins, heavy metals, and free radicals. As a powerful antioxidant, glutathione helps you fight many health conditions associated with aging. That's because free radical damage is behind many of the health problems of old age. Glutathione also helps your liver remove heavy metals and chemicals such as drugs and pollutants. But you can't just take glutathione supplements to get more of it. That's because stomach acid destroys it before your body can absorb it. You have to use other supplements to trigger glutathione. So now you have a whole new way to create more glutathione, with phosphatidylcholine. A German study shows phosphatidylcholine can restore glutathione levels to youthful levels.2 Another study shows it boosted glutathione levels in children. And there's still more good news about phosphatidylcholine! Improve your blood flow and circulation. Remember I said phosphatidylcholine helps keep cell membranes soft and flexible? Well this can reduce the tendency of red blood cells and platelets to stick together. This can help improve your circulation. Improve your lipid (fat) profile: Phosphatidylcholine can help lower homocysteine levels, a well-known risk factor for heart problems. Reduce inflammation: A good fatty balance helps keep inflammation in check. A bad fatty balance promotes inflammation. So by improving your lipid profile, phosphatidylcholine helps smother the flames of inflammation throughout your body. Support healthy digestion. Fats and lipids — including some vitamins — are insoluble in water. They need to be broken into small particles and mixed with water before they can be digested by the body. Phosphatidylcholine plays a key role. Protect your stomach against damage from NSAIDs: Millions of Americans take these popular painkillers and many suffer stomach problems as a result. But purified phosphatidylcholine can help heal stomach ulcerations and relieve stomach pain caused by NSAIDs. Boost energy and endurance: Studies show phosphatidylcholine can reduce muscle damage after exercise, improve lean body mass and boost recovery. So now that you know your body needs phosphatidylcholine. The question is … how do you get it? Well until now, you had to eat foods that contained it. Like beef liver, chicken liver, eggs, beef steak, cod, peanut butter and milk. But not everyone likes these foods. And some of you are cutting back on these foods because of their high fat content. Other ingredients: Gelatin, glycerides, fatty acids, glycerol, ethanol, water. Contains No: wheat, gluten, corn, soy protein, yeast, dairy products, artificial colors, sweeteners or preservatives. Another choice might be to take a supplement called lecithin. Lecithin is a fatty substance found in plants and in your body. It contains some phosphatidylcholine. But many people don't like the taste and consistency of lecithin. And lecithin granules won't dissolve in juice or milk and may ruin the taste of whatever you put them in. I've found a source of phosphatidylcholine that outperforms every other product on the market. It's called PhosChol®. PhosChol is the first and only all-natural, 100% pure source of phosphatidylcholine available in North America without a prescription. What's more, PhosChol isn't just any type of phosphatidylcholine. It contains a special type called "dilinoleoylphosphatidylcholine" or DLPC. DLPC is the most desirable and biologically active form of phosphatidylcholine. Scientists checked this by "tagging" DLPC with an isotope, so they could track its presence in your body. They discovered more than 50% of DLPC is absorbed by your body when you take PhosChol. 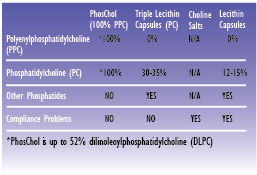 That means PhosChol delivers 10 to 30 times more DLPC than standard lecithin or other phosphatidylcholine products. This extraordinarily high concentration of DLPC sets PhosChol apart. Studies show that up to 60% of DLPC remains in your cell membranes after two whole weeks. This is simply stunning. No other phosphatidylcholine product does this. Not choline salts. Not lecithin. Not even triple-lecithin. That's why my friends at Advanced Bionutritionals added PhosChol to their excellent line of products. There's simply no better way to get a concentrated dose of phosphatidylcholine in your diet every day. So if you want to keep your cells young — and running at peak efficiency — PhosChol is the way to do it. I take it every day and you should consider taking it too. I want to keep my cells young and vibrant! Although PhosChol may be new to you, it has been thoroughly tested. Millions of Europeans and Asians have used a product similar to PhosChol for years with proven results. There are no known side effects or interactions with drugs. And purified phosphatidylcholine has been studied and researched in hundreds of human and animal studies. Try PhosChol Today and Save Up to $30.00 Plus Free Shipping! If you are wrestling with high cholesterol ... memory problems ... heart issues or a weakened liver, I strongly recommend you try PhosChol. You won't find PhosChol at health food stores. But thanks to Advanced Bionutritionals, you can now be among the first in North America to benefit from this potent nutrient. And you can get it for as little as $24.95 per bottle. 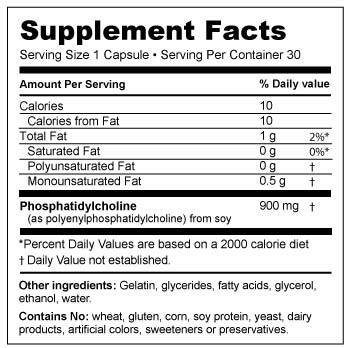 You can try PhosChol at ZERO risk because every bottle is backed by our "Down-to-the-Last Capsule" Guarantee. ... OR if you decide to send it back for any other reason whatsoever ... simply return the empty bottle within 90 days of your purchase and you'll receive a 100% refund of every penny you paid — including shipping and handling. No questions asked. You only pay return shipping. That's fair enough, right? I highly recommend PhosChol. I take it daily myself, and give it to all my patients with vascular issues. Click here now to keep your cells young, running at peak efficiency and supporting your entire vascular system! If you want to keep your cells nourished ... your memory sharp as a tack ... your cholesterol in the healthy range ... then I urge you to consider a 6-Month supply of PhosChol. You'll pay just $24.95 — the lowest price per bottle. You will save $30.00, plus you don't pay a cent in shipping. Why have I done this? Because I want to get this powerful nutrient into your hands as quickly as possible — so it can start repairing your damaged cell membranes and improving your health right away. So think of it as my friendly little way of nudging you to try PhosChol right now! Click here to start rejuvenating cell membranes in every cell in your body! My whole philosophy is to help your body heal itself. PhosChol is a beautiful way to do just that. It helps your body repair damaged cell membranes. It makes them more flexible and permeable—able to absorb nutrients and keep out toxins. It helps each cell produce more energy. And much, much more. Good health starts at the cellular level. When your cells are healthy, you're healthy. PhosChol is your secret to staying healthy well into your 80s and beyond. Imagine how great it'll feel to watch your cholesterol numbers drop. Imagine visiting your doctor one day as he smiles and says "Your cholesterol is back to normal!" Imagine having a memory as sharp as it was years ago. Being able to remember names, numbers, and lists of things to do. Being able to learn new and exciting things, like a new language or new things on the computer. And imagine having loads of extra energy that comes from clear circulation, from more oxygen reaching your cells, and a stronger immune system. PhosChol can give you all this and more. It gives your body the vital phosphatidylcholine that's critical to maintaining healthy cell membranes and neurotransmitters. You'll rejuvenate every cell — just like nature intended! Millions of people in Europe and Asia have benefitted from PhosChol. Now it's your turn. That's why I urge you to try PhosChol with this special offer. You have my word that every bottle is 100% guaranteed or your entire purchase price (including shipping and handling!) will be promptly refunded. So why not order your supply today! P.S. PhosChol is the first and only all-natural, 100% pure source of phosphatidylcholine available in North America without a prescription. It can rejuvenate your cell membranes to support healthy cholesterol and triglycerides, sharper memory, healthier liver, and even boost your master antioxidant, glutathione. Why not ask for your risk-free trial today?! P.P.S. Remember, with our 6-Month Value Pack, you can get PhosChol for as little as $24.95 a bottle, plus, shipping is absolutely FREE. And you are fully protected by our 100% Down-to-the-Last-Capsule Guarantee. So don't wait. Click here to order now or call toll-free 1-800-791-3395 today. ACT NOW! Order Your PhosChol Today!